It is 1922. Prohibition has a three year track record, and U.S. women enjoy their second year of the right to vote. One of the most popular songs in America is Al Jolson’s version of Toot Toot Tootsie (Good-Bye). Silent film stars Mary Pickford and Douglas Fairbanks celebrate their second anniversary and the League of Nations (the precursor to the United Nations) celebrates its third. U.S. women comprise less the 25 percent of the work force and of those women who work, approximately 25 percent are in white-collar jobs, 25 percent are in manufacturing jobs, less than 20 percent work as domestic servants, and most of the balance work in agriculture. Women begin to don the haircut called the “bob” sported by actress Colleen Moore in the 1920 silent film Dinty. This year the Radium Dial Company continues its recently relocated business in a town named Ottawa, Illinois, about 80 miles southwest of Chicago. And in 1922, Catherine Wolfe Donohue begins a new job at this company located just blocks from her home. The work at Radium Dial involves painting luminous numbers on watch and clock faces for pennies a “dial”. The material Catherine and her colleagues use to paint constantly glowing timepiece dial face numbers is laced with a valuable newly discovered ore called radium. This element was tested for scientific purposes, used during the World War in airmen’s and soldiers’ timepieces and asserted to have medicinal, therapeutic and cosmetic uses. The women of Radium Dial ingest this new compound while doing their work, painting the dials, pointing their paintbrushes between their lips, breathing the radium-filled dust, and sitting near the completed dial faces stacked beside them at their work stations. And for Catherine, this was her way into a new life, this new American woman, this independence. As dramatized by playwright Melanie Marnich in These Shining Lives, Catherine revels in the sensations of working after her first day of work . In 1922 our dramatized Catherine Donohue is in awe of the “now” that is possible. 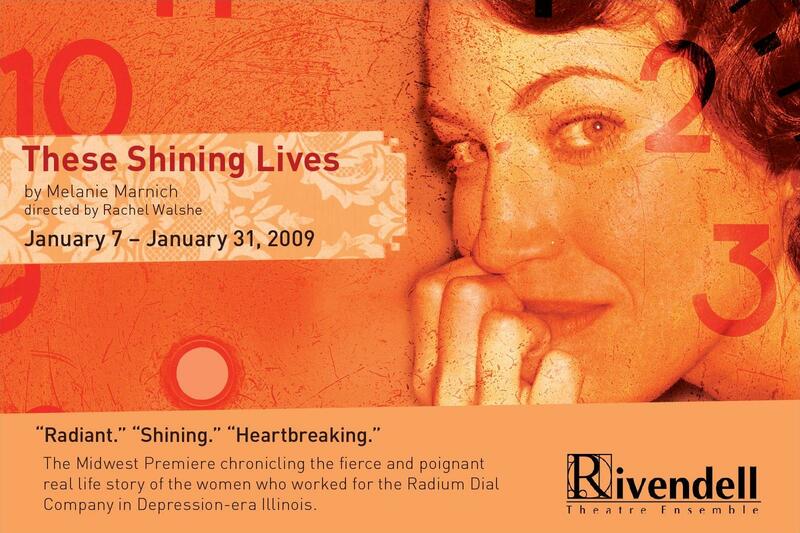 Sixteen years later, the dramatized and well-documented Catherine testifies on behalf of herself and other dying former Radium Dial employees as “Ottawa’s Living Dead.” This play is their story of humor and independence. And so much more. “All Radium Plants in Federal Inquiry: Labor Department States Search to Discover the Cause of “Radium Necrosis”, Hears of No Other Cases, New Occupational Disease Would Affect the Workmen’s Compensation Law”, New York Times June 21, 1925. “The Story of Radium: Madame Curie’s Discovery Followed Years of Striving – How America Took The Lead”, New York Times May 15, 1921. “Woman Tells of ‘Living Death’ at Radium Quiz: Former Watch Painter Faints; Halts Hearing”. Chicago Daily Tribune, February 11, 1938.